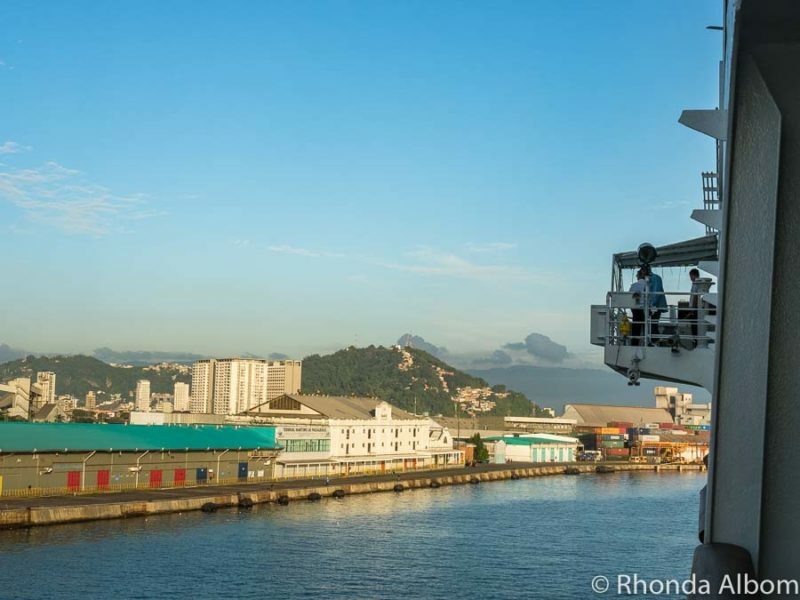 As we cruised into the Santos Brazil port, passing South America’s largest dock, we had two choices for our day on shore. 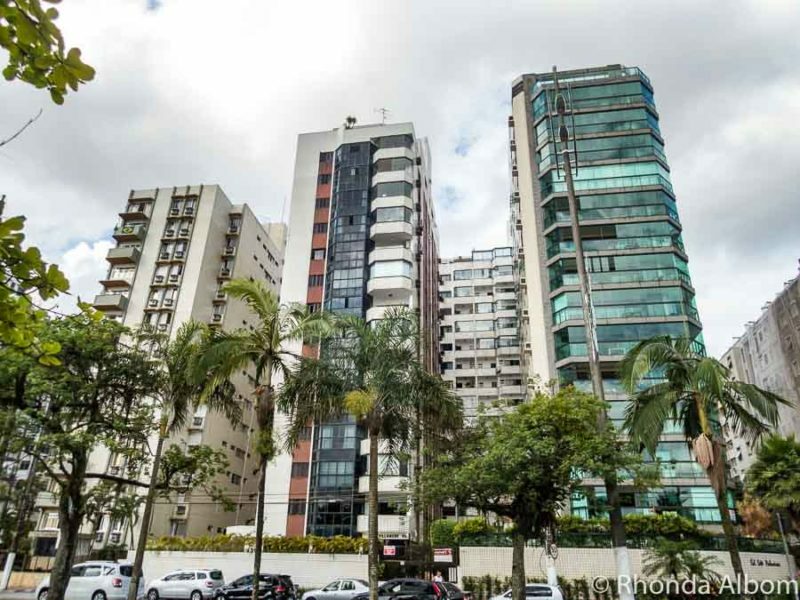 We could spend it in São Paulo, Brazil’s largest city, or stay in its seaside resort town of Santos and enjoy some of the world famous Santos coffee, relax at one of the many beaches, ride the funicular, or stare in wonderment at the tilted buildings along the coastline. With 63 leaning buildings intermixed along the oceanfront, it’s a bizarre look. They are mostly apartment buildings. Engineers check the stability of these apartments annually and the buildings remain habitable by brave souls who don’t seem to mind the unsteady environment. Apparently, a marble placed on the high side of one of the units will roll downhill, furniture needs to be shimmed, and a full cup will often overflow. I wonder if dishes fall off the tables? To date, only one has been straightened. We are unable to find any being used as hotels or even nightly rate apartment rentals. Just beyond Canal 5 is the apartment building with the greatest lean at 6%. Why do the buildings lean? The problem stems from lax building codes some 50 years ago. While 63 of the buildings are inspected annually, it is estimated that nearly every beachfront building (over 650) leans to some degree. The most simplistic explanation is that to be stable, the foundations need to be anchored in bedrock. Above the bedrock in Santos is 30-40 metres of unstable clay covered by 7 metres of surface sand. The foundations are anchored in the clay and as it shifts, so did the building above. Today’s building codes are more rigid. 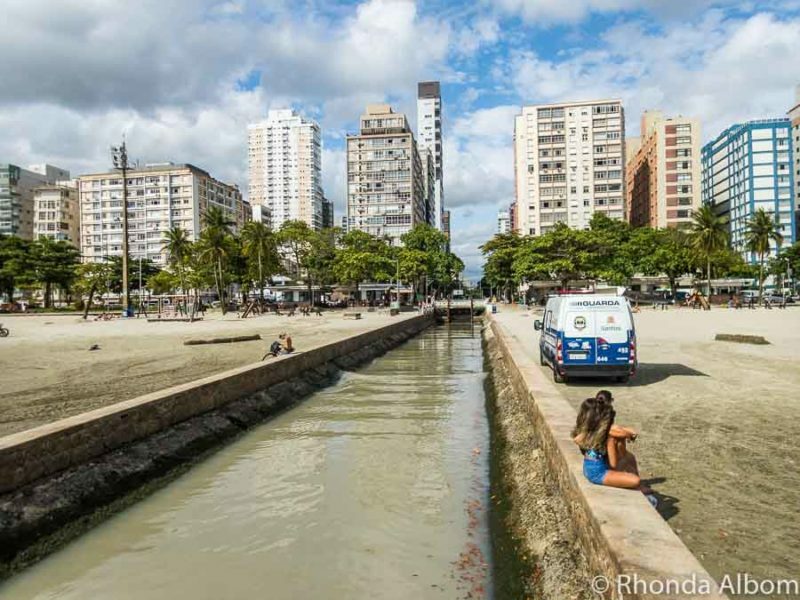 Water is key to this city, with seven major beaches covering five miles and 19 canals that have earned the city the nickname “the Brazilian Venice.” Alongside the sand runs the world’s largest garden in front of a beach. One of the canals as it crosses a beach leading out to sea. 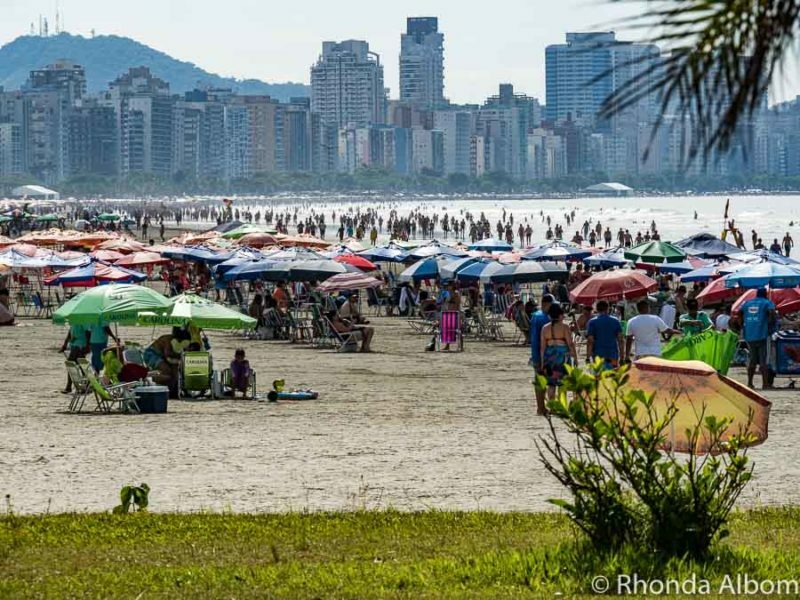 The main section of Santos beach is popular, offers surf lessons, and was quite crowded the day we were there. This section of beach had gentle waves, was less crowded, and is a short walk from the Praiamar Mall, a free shuttle bus stop offered by our cruise line. This small island just offshore is nicknamed the Island of Cobra according to our guide. (Portuguese name is: Ilha de Urubuqueçaba). Apparently, if you stand on the shore long enough, you will eventually see a bird of prey swoop down and pick up a snake. We didn’t stay there long enough, nor do have any idea how often this happens, or if it really does. For me, there are two obvious highlights of the Santos Coffee Museum. 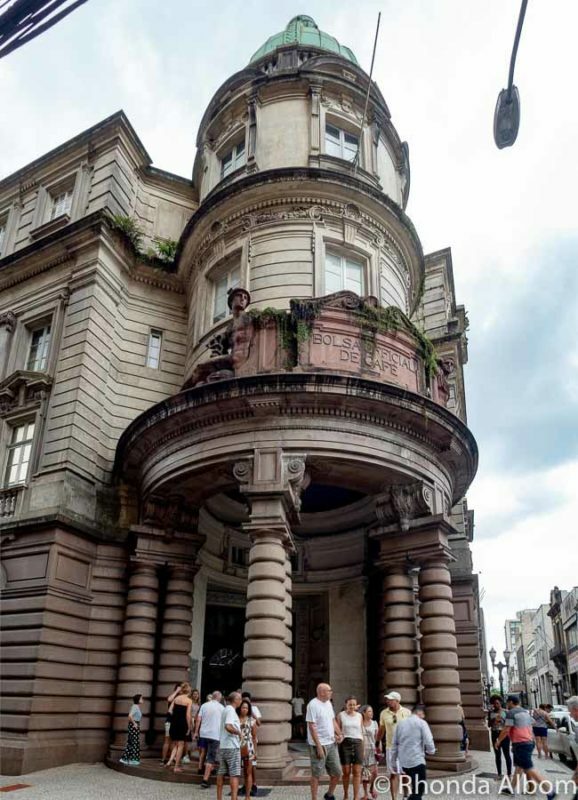 First is the architecture of the building that is the former coffee exchange market. Secondly, it is in the Coffee Museum Cafe where we had the best cup of Brazilian arabica coffee. As for the museum portion, the exhibits are heavily worded, all in Portuguese. The Coffee Museum is 4.5 km (2.8 miles) from the Santos port cruise terminal. The entrance to the Santos Coffee Museum. 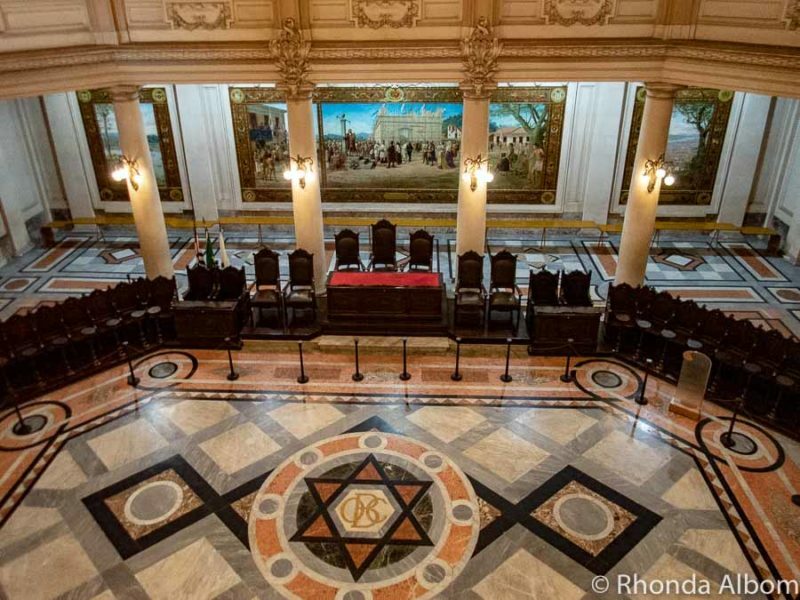 Looking down on the old coffee exchange room in the Santos Coffee Museum. Interesting fact: Today, Brazil is the world’s largest coffee producer, and the USA is the world’s largest coffee consumer by volume. Football (soccer) fans know that Pelé is often considered to be the world’s greatest player. Now living in the hills between Santos and São Paulo, he once played in Santos stadium. Small by world standards, it holds 35,000 spectators. The stadium is about 6 km (3.7 miles) from the Santos port cruise terminal. If you are an over-the-top football fan, then check out this private football shore excursion. 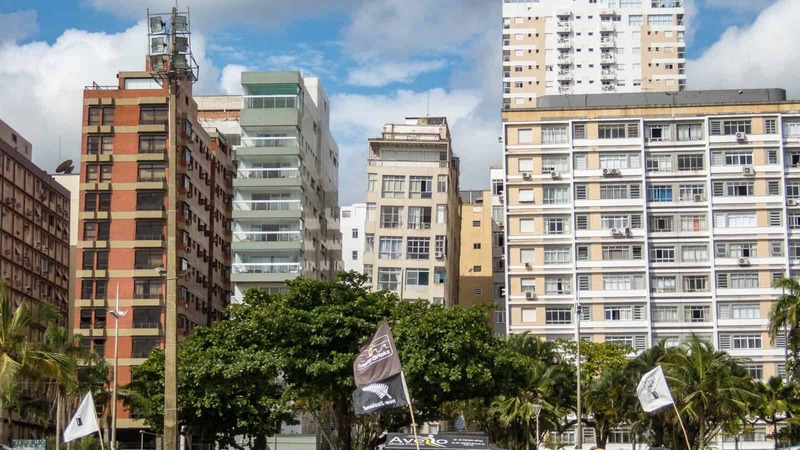 It will take you to the Santos Football Stadium, the Pelé Museum, the São Paulo Stadium and Museum, the Palmeiras Stadium and Museum, and the Corinthians Stadium and Museum, before returning you to your ship. For great views over the city, we took the funicular up to the top of Mount Serrat. 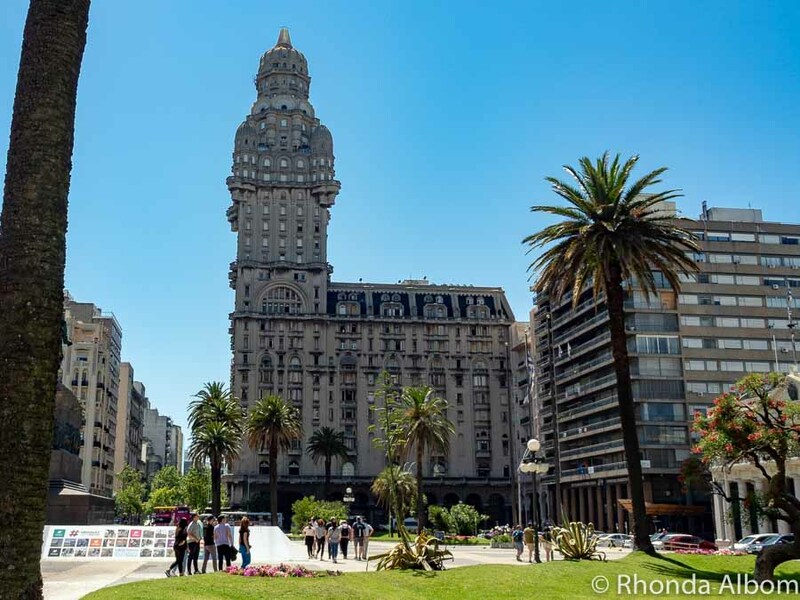 The building at the top, now a cafe, is a former casino that was popular in the early half of the last century until Brazil banned casinos in 1946. Brazil has since banned bingo halls (2007) as there was concern that they were laundering money. Also at the top is a tiny church, Our Lady of Mount Serrat. It was built in 1605 to protect the city from pirates. The entrance to the funicular is 4.5 km (2.8 miles) from the Santos port cruise terminal and 1.2km (.8 miles) from the Santos Coffee Museum. There are two funicular cars on Mount Serrat; we are on one, looking up at the other. One of the many views from Mount Serrat. Taxis with meters are generally considered to be safe. A public bus can be a good option if you speak Portuguese. If not, you may find it difficult to navigate as the signage will be in Portuguese, and the bus drivers will generally speak only one language. If you are visiting from a cruise ship as we did, you can save money by taking an independent excursion. Admire sea life at the Aquarium of Santos (family-friendly). Take a ride in the old trams. 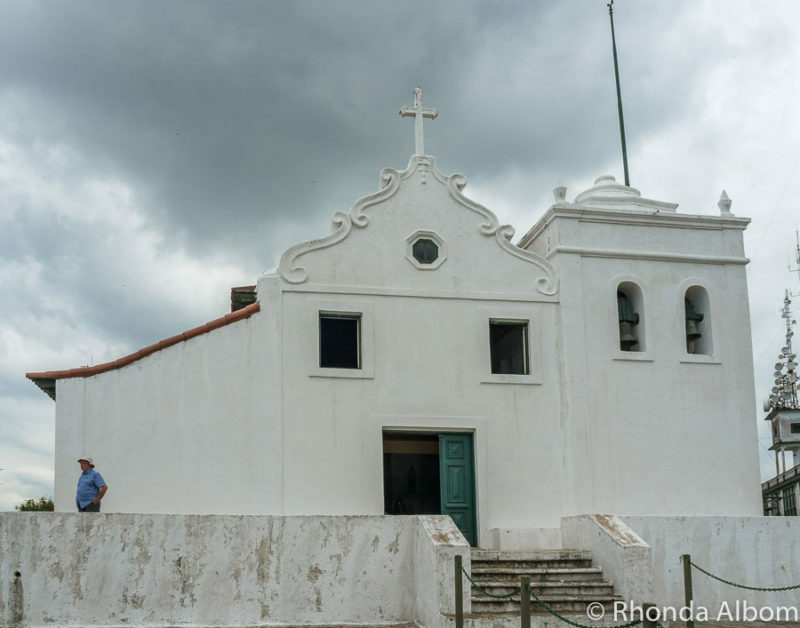 Discover history at the old fortress of Santo Amaro. Enjoy over 6,000 orchids at the Municipal Orchidarium. Shop at the modern Praiamar Mall. 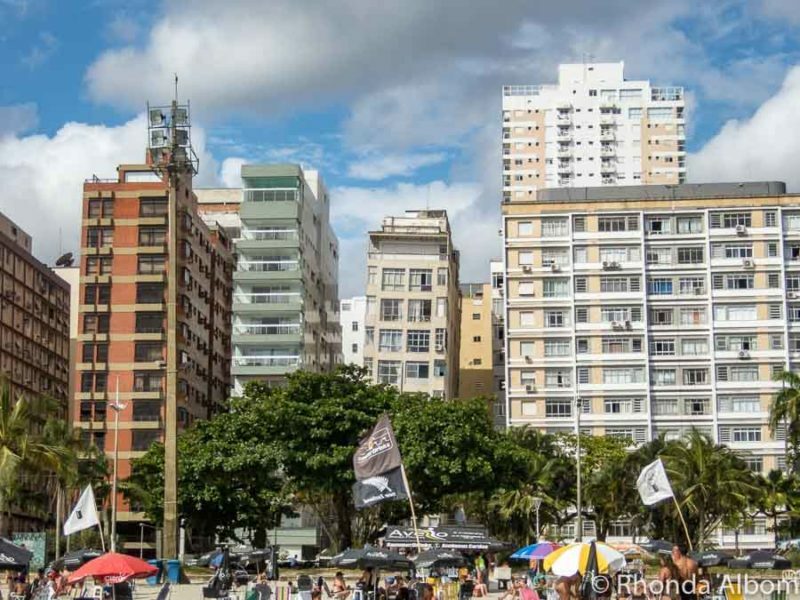 Spend a day in nearby São Paulo. We opted not to do this as it was the week between Christmas and New Years in Brazil and the normally heavy traffic that separates these two cities was expected to be worse. With predictions of up to four hours to return to the Santos port if we went to São Paulo, we opted to stay in Santos city. Drive time with no traffic is about an hour as the two cities are only 75 km (46.6 miles) apart. Watch the boats at Santos Port, Latin America’s busiest container port with nearly 16 km (10 miles) of docks. Cruising past a section of the 16 km long port of Santos Brazil, we can see the ships bridge in the upper right of the image. 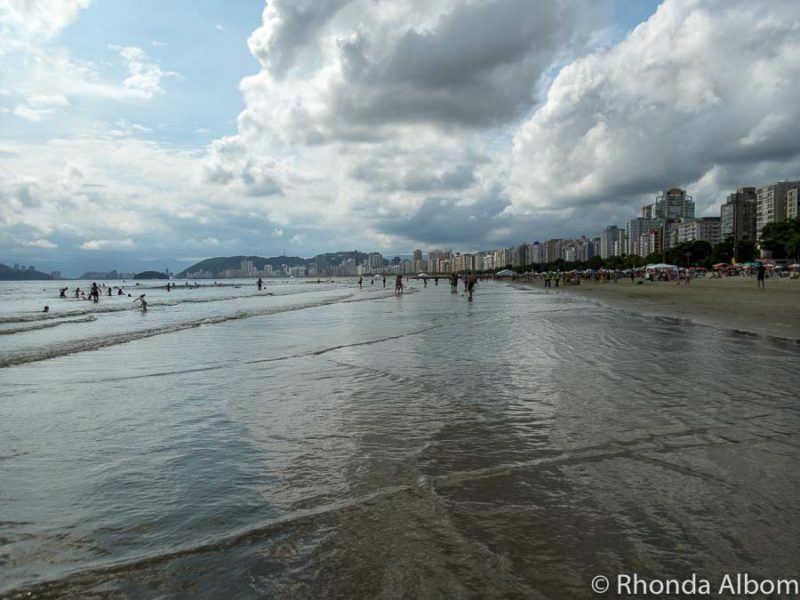 Follow the same basic safety tips as in Rio de Janeiro. Be sure to notice the leaning coastal buildings. If you are a soccer fan, don’t miss the Pelé Museum. Even in the shopping malls, if you pay with cash you can ask for a discount, and will usually get about 5% off. The coffee museum will take US dollars, but most places in town will only take Brazillian reals. 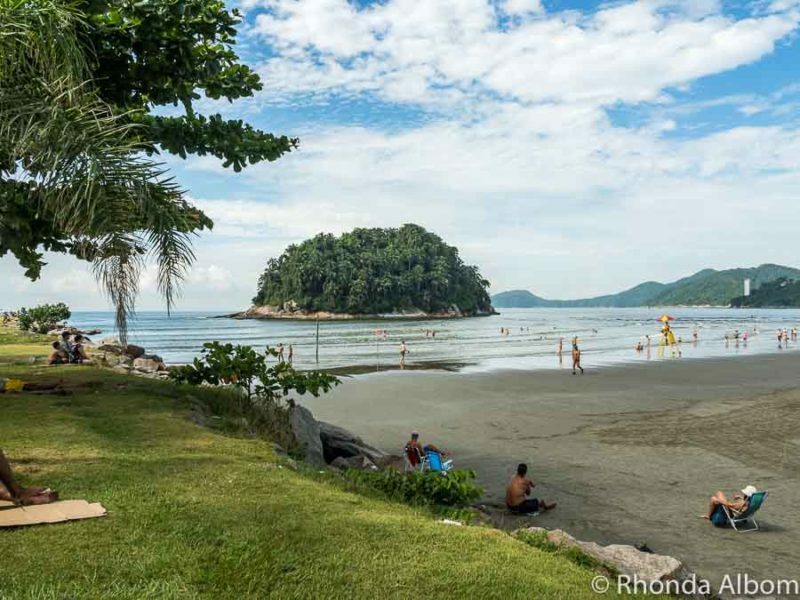 Other nearby Brazilian ports that we visited included: Paraty, Buzios, Itajai, and Rio de Janeiro. If we weren’t on the ship, I could easily imagine myself staying in Santos a while. It’s a relaxing seaside community. With a reputation like that of Flordia in the USA, Santos is a popular retirement community with about 20% of the population over age 60. In Brazil, my mirrorless camera (Olympus OMD-em5 Mark II) never left the cruise ship. Instead, I took an Olympus TG5, a tough little shockproof, waterproof, dustproof, crushproof, and freezeproof point and shoot camera that has an option of RAW output, and as you can see from above, takes great shots. It’s the perfect camera to keep in my pocket, especially in questionably safe areas. If you cruise into Santos Port Brazil, where will you spend your day: drinking Santos coffee, relaxing at one of the Santos beaches, or in São Paulo? Would you live in a leaning building? Great shots of an amazing place! Santos Port seems a cool place as a layover of port in Brazil. I would love to explore the small port city like you did. 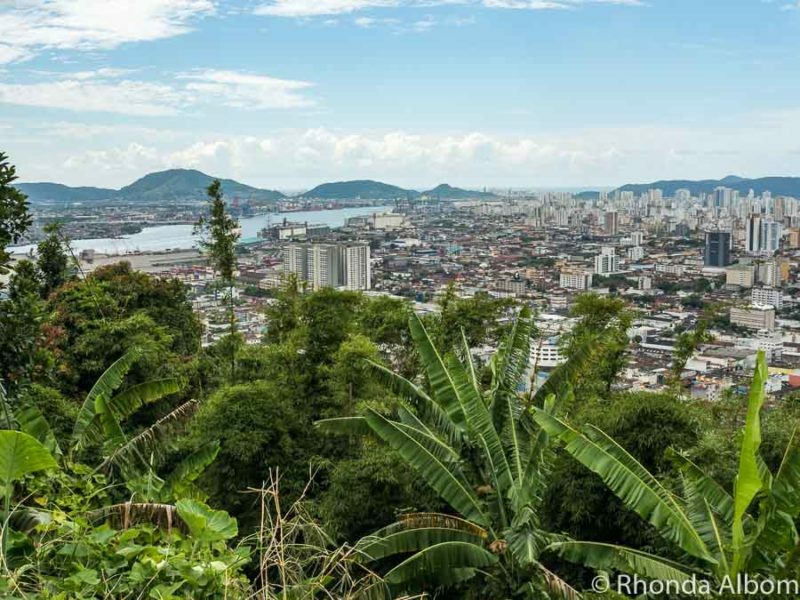 You have given many options of what to see in this Brazilian city and how to get around. Thanks for sharing such informative posts. Lovely photos as always! I lived in a leaning house once… Marbles didn’t roll along the floor, but whenever I backed a cake it was very clearly higher on one side of the pan than the other. Beautiful photos! I can’t imagine how people can be happy living in those leaning buildings. Hopefully, the rent is cheap? Love the Coffee Exchange building! That must be truly spectacular in person. I would want to go there and indulge my architectural fetish. Thanks for this fabulous travelogue! What wonderful views! I like the shot with all the colorful umbrellas. So happy to find this article, my husband grew up in Santos in Brazil and I have never really seen many photos of it. The leaning buildings would totally freak me out. Thank god its not an earthquake prone area! Those leaning buildings make me dizzy. They look so dangerous! 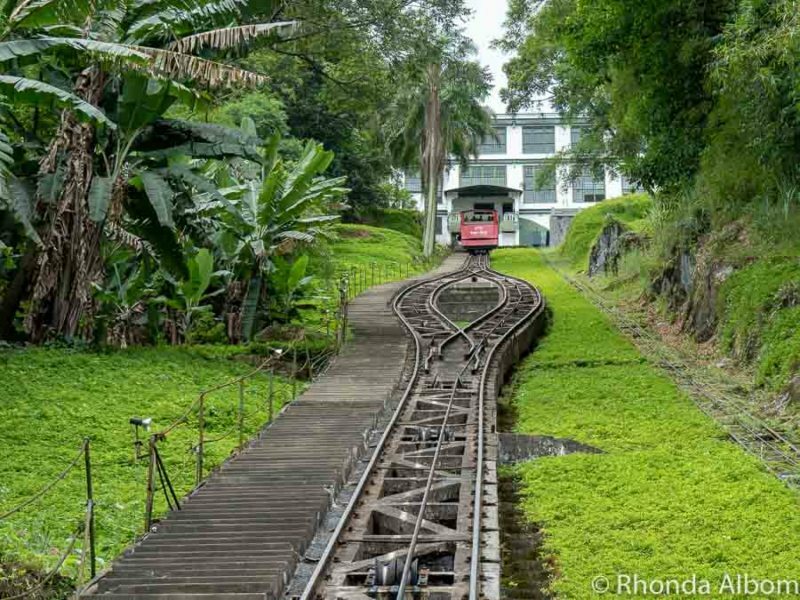 The funicular is very appealing. Thanks for the travel info. Brazil is definitely on my list. Santos Port is a long way away, very reason why I crave to visit it some day. You increased my eagerness with the mention of leaning buildings. I am keen about the Pele museum too. I can’t believe how irresponsible the builders in these countries are. Someone (perhaps the architects, or the structure engineers) must have known that the terrain underneath these buildings is shifting and should have foreseen what’s going to happen. Those poor people living in these buildings! I’m sure they don’t have much choice, that’s why they are putting up with it. Aside from this however, Santos looks quite charming. I’d love to visit Brazil someday. I can’t get over those buildings – I could never! I have chills just thinking about being in one of them. I’ve always wanted to go to Brazil, and clearly there’s so much to do in Santos. Hopefully one of these days! What an awesome post. Gets me to armchair travel. Thanks. 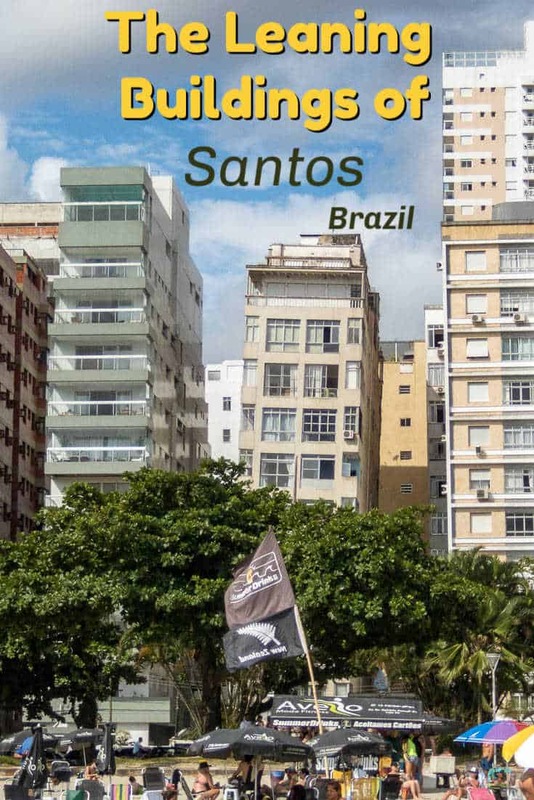 We’ve never heard of the leaning buildings in Santos! Very interesting and I’m sure that you see the leaning even better in real as compared in photos! And taking the funicular up to Mount Serrat for the panoramic views sounds like an awesome experience too. Thanks for sharing this! 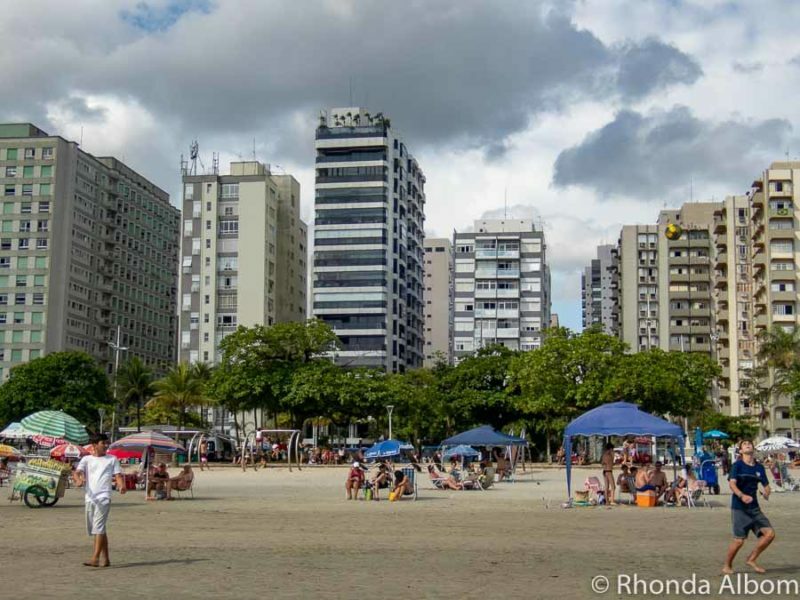 Woah, that beach in Santos is so incredibly crowded! That’s exactly what I hate about a lot of European beaches. You’re packed in next to each like you’re stuffed into tiny tables in a Parisian cafe. No thanks. But the beach at the Island of Cobra looks nearly empty. That’s be more my cup of tea for hanging out on the beach. Not so keen if there are actually cobras around, though! Those leaning buildings, oh my! I would not want to be on the top floors! The beach looks very crowded but beautiful, with the colorful umbrellas. What a fascinating port city (but I would skip the cobra beach, just in case the story about the birds and snakes is true!). We are booked to visit South America in 2020. So we are starting to look for ideas on what to see and do. We will sail into Sao Paulo so it is great to see that a day trip to Santos is a great way to spend that port day. The leaning buildings certain are bizarre. We are coffee snobs. So a visit to the Santos Coffee Museum is definitely something we would like. And a ride up the funicular would be great for a panoramic view. Thanks for giving us a view of this option. 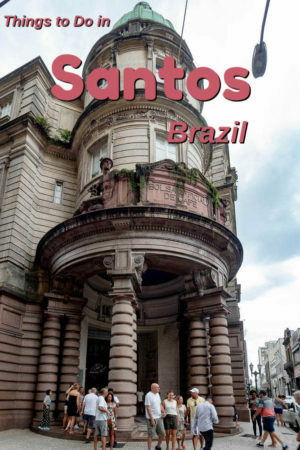 Never been to Brazil and never heard of Santos Port but I would love to go here and check out those leaning buildings. Wondering if it was an problem whilst building them or an earthquake and they managed to stay up. I can’t imagine what it must be like living in leaning building. I hope the rent is cheaper. It might make a fun airbnb to stay at for a few nights. I love funiculars and drinking coffee so this sounds like my kind of place. 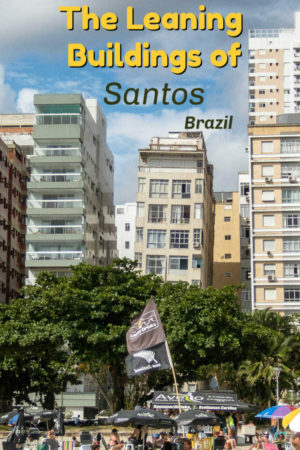 I would love to visit Brazil- I have never heard of Santos Port before! The city looks amazing! I would love to see the Coffee Museum in person one day! I’m all about the water so I’d definitely pick Santos over Sao Paolo. What an interesting place with those buildings. I’m amazed that people actually live in them but I guess it’s normal to them. Oh my Rhonda. People really live in those building that lean? Are they crazy? This entire place is weird to me. It’s not a place for me. See ya my friend. That first one is sooooo crooked. I wonder if you get a tilt in your life – so even in a flat place you under fill the cup etc? Santos beach looks absolutely gorgeous. A spot to put on my vacation list for sure. Oh my word- leaning buildings? I think that would totally freak me out! Your photos are so beautiful of such an interesting place! The coffee museum 😍😍 That’s heaven for me! And the leaning buildings are quite scary – won’t the fall after a while because of the problematic foundations? That one building really does lean. I bet taking the funicular cars up is a lot of fun. Brazil is on my bucket list! There are so many things to do there too! Crazy how they have all of those leaning buildings along the beach too…I’d be terrified to live in or near one, haha! Wow leaning buildings. Pretty scary and cool. Makes sense based on the reasoning though. Beautiful country, but doubt I’ll ever see it. Safer to look at pictures anyway. Obviously there aren’t cobra swimming in that bay…? I got stuck on the leaning apartment building. Yikes. I’ll pass. What a beautiful city and you got some fabulous shots. There are 63 buildings that lean so far they need to be inspected annually. Can you imagine living in one of them? I think it would be dizzying.